Lucky for me, I’ve done some experimenting in my microwave/convection oven over the past month. 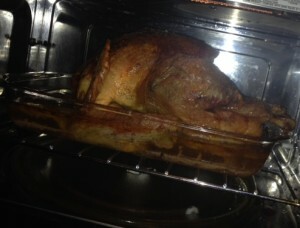 On Thanksgiving, I rolled out the most fantastic, roasted turkey that I quite possibly have ever cooked. And, I did it in just under four hours in the convection roast mode of my oven in our rig. In order to use any of the convection features of your microwave, you must use the baking racks that came with the unit. There were at least one, and probably two, racks that came with the appliance. Removal of the racks is necessary when using the microwave. But for baking or roasting, the racks are essential to get your dish off the floor of the oven so air can circulate freely around the pan. There is a bit of preparation; however, it doesn’t take very long at all. To roast poultry of any kind in this sort of scenario, I have figured out that infusing the meat prior to roasting makes a huge difference in the overall outcome of your main dish. When cooking the turkey, carefully remove all the insides of the bird (liver, gizzards, etc.). Rinse the turkey, inside and out, and pat dry. 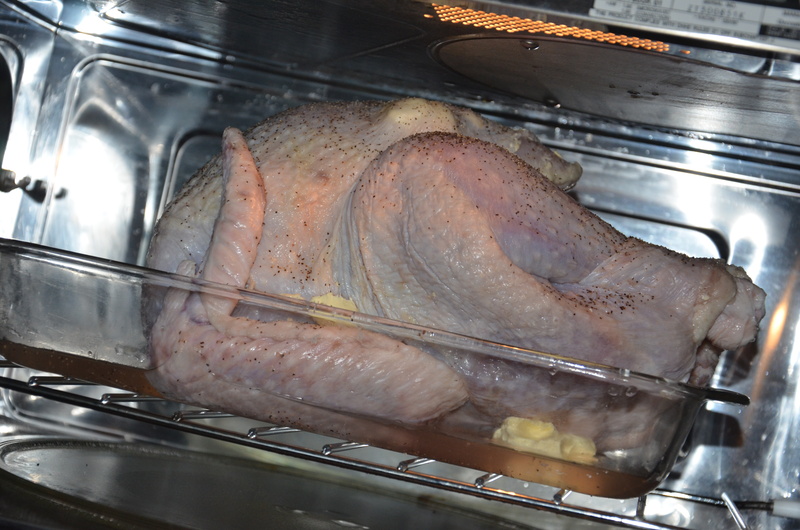 Place the meat (breast side up if you are cooking a whole bird) in a shallow 2-3″ deep baking pan. Spray or brush the skin with cooking oil. (I like to use canola oil). Next, carefully, run a finger between the skin and the top layer of the meat. Be careful not to tear the skin. Insert small pats of butter between the layers. I used about a stick of Parkay margarine when cooking the example above. When finished, sprinkle generously with salt and pepper or a seasoned salt mixture. Finally, if the turkey is not to be stuffed, fill the cavity with carrots and celery for additional flavoring and to help lock moisture in. Cook a whole turkey at 325 degrees in the convection microwave oven according to the chart below. 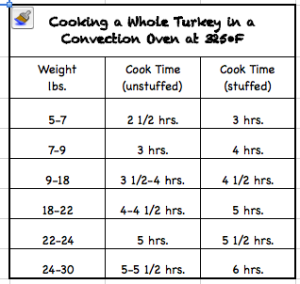 Depending on the wattage of your appliance, cooking times may need to be adjusted. In addition, you may place a piece of aluminum foil loosely over the breast and legs to prevent overcooking. I roasted a 12-pound Thanksgiving turkey in four hours. It came out perfectly moist and tender. As always, check the inner temperature so that it is 180 degrees in the thigh. Transfer the the main event for your holiday meal to a serving platter. 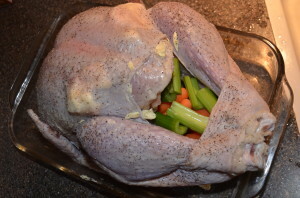 Be sure to let the cooked creation rest for at least 20 minutes before carving. Voila’, the main course is served! Other ideas for the main attraction of the holiday feast include ham, prime rib, and roast beef. 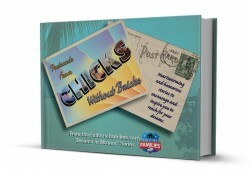 Watch the recipe box for additions later this week as the Road Mom crew experiments further. Stay tuned tomorrow for Part 2 of this series when we look at savory salads to accompany any festive fare.